During the interview, Blomkamp talked about the themes he’s addressing in the film, what he thinks the world might really be like so far into the future, working with a bigger budget this time around, and why it’s taken three years for him to get another film out. He also talked about another film that he’s written, which is a sci-fi comedy called Chappie, about a robot character, and how he feels about higher frame rates and 2D versus 3D. Check out what he had to say after the jump. Also, check out our recap of the Comic-Con panel. Question: Since so little is known about it, what can you say about this film? NEILL BLOMKAMP: It’s a film about an orbital space station that has the rich living on it, while Earth is diseased and has been left behind, with the money and the resources having left. Matt [Damon] is from Earth and Jodie [Foster] is from the space station. What sort of themes are you addressing, with the rich versus the poor? BLOMKAMP: The film definitely has elements of the haves and the have nots, and the discrepancy in wealth that seems to be a widening gap. But, hopefully it is a film where that is woven into the tapestry of the story, in a way that feels like an organic science fiction thrill ride. The themes are touched upon, hopefully in a fairly realistic, not over-the-top way. What do you think the world will really be like, this far into the future? BLOMKAMP: That’s completely accurate. Science fiction for the sake of science fiction, if it’s about science, is not really what this film is about. It’s more about using the imagery as an extrapolation of what the idea is. 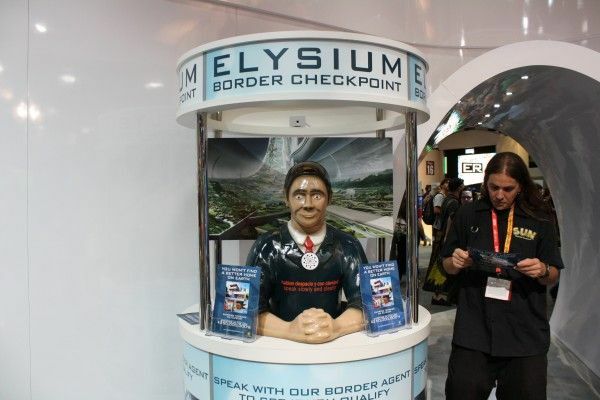 Does Elysium feel entirely realistic, as the year 2154? It’s probably not entirely realistic. It has elements that may be semi-realistic, but most of it comes from how you turn theme into visuals and into an idea. It’s somewhat a play on not a perfectly exact representation of the future, in my particular book. It’s more devoid of technology than it would be in 2154, even if the money was pulled out. What was it like to work with a bigger budget, this time around? BLOMKAMP: Making this film was as enjoyable as making District 9. Maybe fractionally more enjoyable because politically it was more stable. It wasn’t scary. Basically, I had an easy time because the performances are just really good. Your job, as a director, is incredibly limited. You just go to get coffee and watch the video assist monitors while other people work. It was easy, is my bottom line. Hanging out with Sharl [Copley] in a slightly different context was cool. There were moments when it definitely felt like we were doing parts of District 9 again. Will audiences find hope in the future that you’re presenting? BLOMKAMP: No. Look at War of the Worlds. The debate between utopias and dystopic science fiction is pretty evenly balanced. Maybe there is slightly less utopian stuff now, but the bad versions have been around for a long time, too. Maybe there is a need to inject back some of the utopia. People that really are speculative science fiction fans want to get it right. Why don’t we see more of trans-humanism and all of the opportunities that we have with technology in cinema? It’s boring because there’s no conflict, really. If there was a way to keep the utopian element and write in conflict, it would be appealing. I just don’t know what that is, right now. Why did it take three years for you to finish this film, after doing District 9? BLOMKAMP: That’s tough to answer. I think I started writing a treatment for this at the end of 2009 and, by the time I finish the film, which is in November, it’s precisely three years. But, I’ve been working solidly, all the time. It’s not a $200 million film or a $300 million film, but it seems to be exponentially greater than District 9, in terms of just how much stuff there is in the film. There are so many different pieces and elements and ideas, and the amount of stuff we had to design and build, and the kind of visual effects we’re doing, is just this absolutely relentless process. You just have to bulldoze through it. So, I’ve been working. I’m sorry it wasn’t quicker, but it’s just taken that long. There hasn’t been any roadblocks. It just took that long. In2010, we wrote another film, simultaneously. That just spontaneously happened, but I don’t know how much time it took away from Elysium. What was that other film that you wrote in 2010? BLOMKAMP: I was writing Elysium and I had this idea for this film, so I wrote it with Terri [Tatchell], who wrote District 9 with me. I was writing Elysium on my own, and I came up with this original idea. Within literally about three weeks, it was done. It was simultaneous. I would just write that with her when I felt like it, and then I would write Elysium on my own, and bounce between them. It was a fairly full-formed idea, so it was quite easy to jot down, and it’s much more simplistic than Elysium, in terms of concept. It’s just a much more simple thing. It’s a science fiction comedy thing. That’s about as far as I can go with it. Will that be your next movie? As a writer, do your films start with the characters or do you create the worlds first? BLOMKAMP: District 9, Elysium and Chappie were all born out of a visual concept first. With District 9, it was wanting to see aliens living in Johannesburg. With Elysium, it was the idea of the separation of rich and poor, and the images of this space station separate from Earth. It was a thematic separation that was visual. With Chappie, it was the imagery of this ridiculous robot character. It’s much more comedy based, in an unusual setting. I think I’m a visual person first, more than anything. They seem to be visual first, really. It’s visuals of ideas. As a filmmaker, how to you feel about the higher frame rates, and 2D versus 3D? BLOMKAMP: It’s a really complex discussion. If you were to show a child who’s six months old right now, a 48 fps film when they’re 20, it would be as familiar to them as you watching 24 fps HD. It’s very much a generational thing. But, for people that are our age, there may be an alien quality to 48 or 60 fps that distances you from it, in a way that I’m waiting to see if the audience gets behind or rejects. It has such a hyper-realism about it that the cinema may be taken away, a little bit. For me, I don’t like it. But, that’s just me, personally. I prefer 24 fps. I definitely prefer 2D over 3D, and that’s a personal preference thing. But, the closer I am to cinema that I grew up with, where I feel like I’m watching a film and I’m in the state of mind that I want to be in when I’m entering a different world, I feel like some of that really crazy hi-res, high frame rate stuff separates me from it. And 3D sometimes has the same affect.